Thanks for visiting Historic Happenings! If you are not on the email list, and would like to be notified via email when a new posting of this newsletter is made, please email Terry Ommen at histerry@comcast.net. I will add you to the list. I will never share your email address with anyone without your permission. Congratulations go out to Carole Mathewson for being the first to correctly identify the Robin Fountain as the last mystery spot located at the Tulare County Library in Visalia. 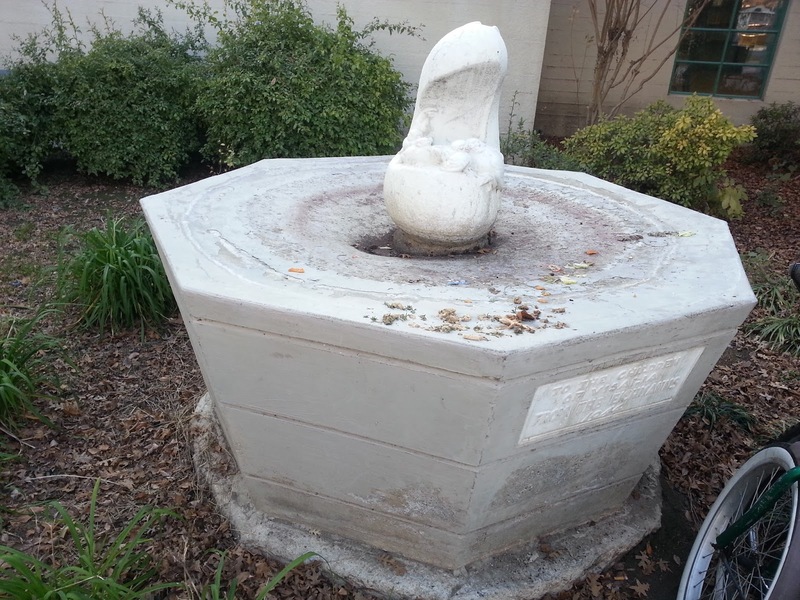 By the way, she was present at the famous birdbath original dedication in 1944. Nice work Carole. 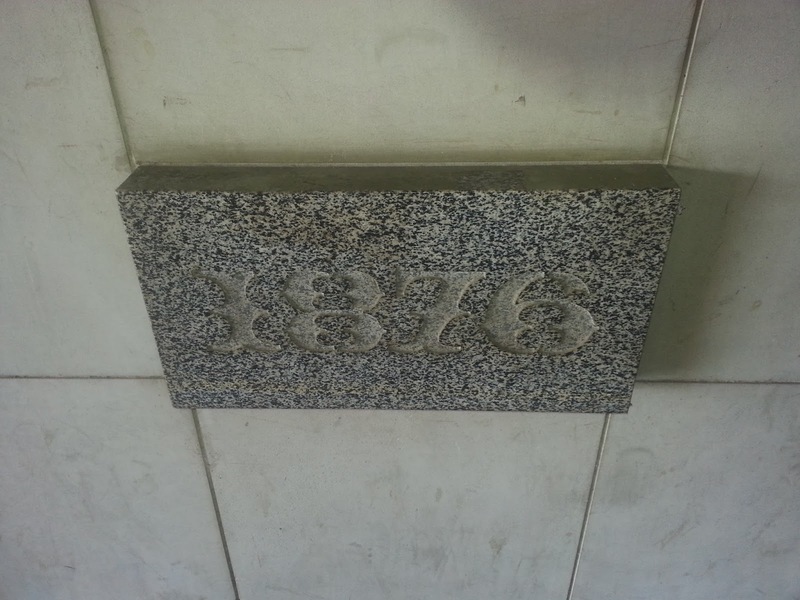 1) This plaque or cornerstone was on a government building when it was built in 1876. 2) The building is gone now. 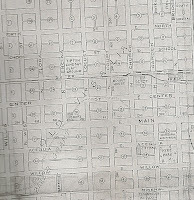 3) It was located in what is now downtown Visalia. What building was this cornerstone located on and where was it? Good luck. 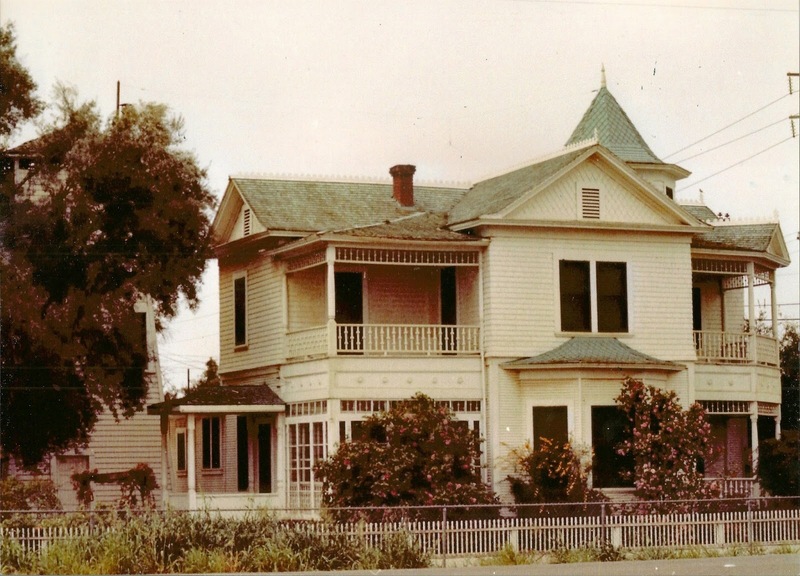 Many of you remember this beautiful Victorian home that stood next to freeway 198 a few miles east of Visalia. Built in about 1902, the stately home was so well-known it became the model for the popular miniature or doll house that Howard Hill built and called the "Visalian." This doll house became very popular and can still be found all over the country, probably the world. The house that you see here was built by the Hilliard's, but was more recently known as the home of Effie Strowbridge. Effie died some time ago, and this house was destroyed by fire in 1983. My friend, Bill Dillberg, a professional Visalia photographer, took this photograph and coincidentally, fought the fire as a volunteer fireman the day it burned. This landmark home turned many an eye in its day and so many were saddened when it burned. Thanks Bill, for taking this photograph and sharing it with us. library is still shown at the Main and Encina streets location. That Carnegie building was vacated when the new library (now the children's library) was opened in 1936. This professionally produced map which is to scale, has display ads all around the outside border. The reverse side of this map shows a partial portion of the map of the state of California. Thanks Jean and Tom for sharing this amazing map. During the 1930s and 1940s, Visalia was a rodeo town. Yearly, cowboys from all over the country would converge on Visalia to show off their skills with horses and cattle. It was a multi-day event with a huge parade and many rodeo competitions. The entire town got into the spirit and city officials loved the chance to show off the town. 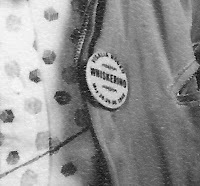 Street dances, fiddler, and rodeo queen contests were part of the hoopla, and city officials encouraged locals to get involved in a "Whiskerino" contest. They promoted the contest by wearing buttons as you can see. The idea was to grow and display facial hair in keeping with the western theme of the rodeo. In this photograph, Charlie Hammer, one of the rodeo boosters, is shown with his "Whiskerino" button. The man next to him is Albert "Pete" Sweeney. Albert's son, Pete, shared this photograph. By the way, Pete Sweeney is an amazing talent at the organ. But you probably knew that, everyone does. Thanks Pete for the photograph and sharing your wonderful gift. For some time I have wanted to highlight a man who was an important figure in Visalia and really Tulare County law enforcement history. His name is Captain W. E. Riley. I don't know how he got the nickname "Squeak," but he did. Captain Riley was not a big man, physically, but he had a stellar reputation and was highly respected. Squeak was the third man hired as part of the Tulare County Traffic Squad. 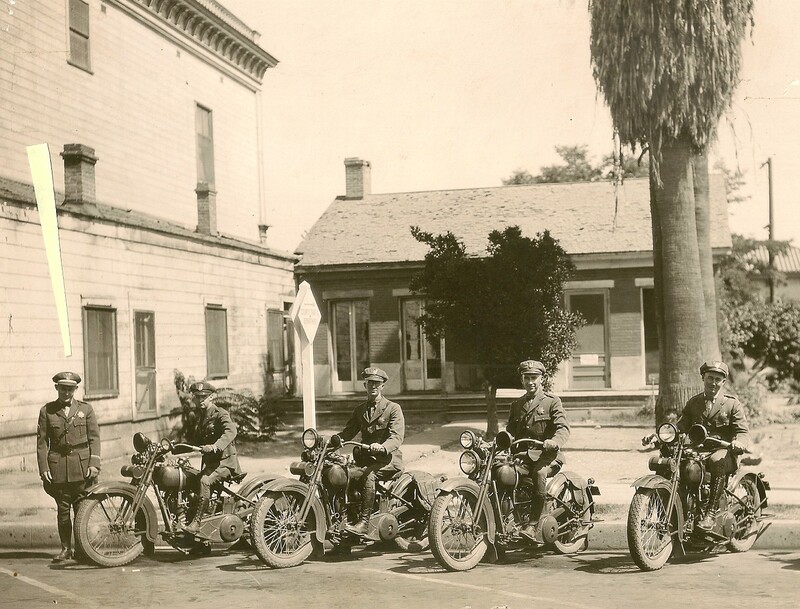 He started his traffic enforcement career in 1920 and was named captain of the traffic squad in 1926. 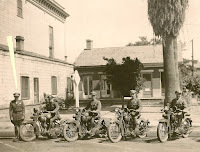 Headquartered in Visalia, the traffic squad office was on Center Street just east of Church. 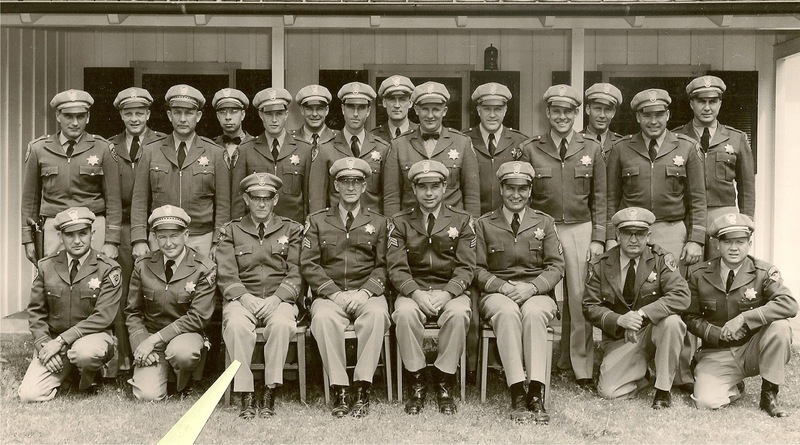 In 1929, the California Highway Patrol was formed and Captain Riley continued as the man in charge during that transition. He retired from the CHP in about 1957, serving in Visalia and Tulare County his entire career. For many years, Squeak was one of the most recognized figures in Visalia. I understand he had one son. Does anyone know if that is true? If so, does anyone know anything about him? The first photograph shown here with his squad is Squeak in about 1926 in front of the squad office, and the other photo was taken shortly before he retired. The CHP office here was on the northeast corner of Stevenson and Mineral King. 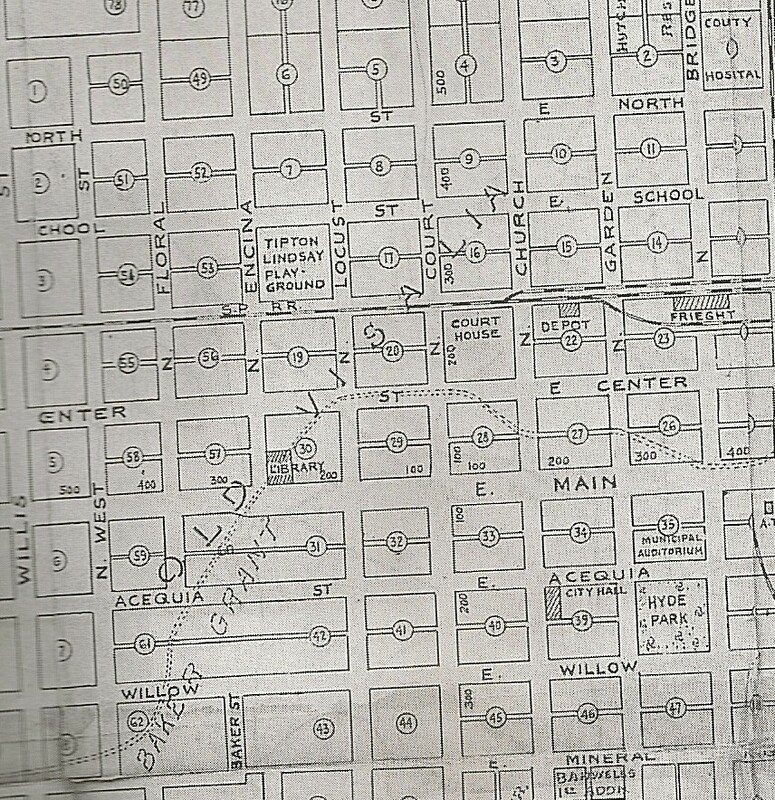 In 1937 plans for the Motel Harlan were drawn up by J. K. Houghan. Mr. and Mrs. Ray Harlan, motel operators, also owned the business. 25,000 adobe bricks were made on the site and used to construct the building. In early 1938, the doors opened for business. 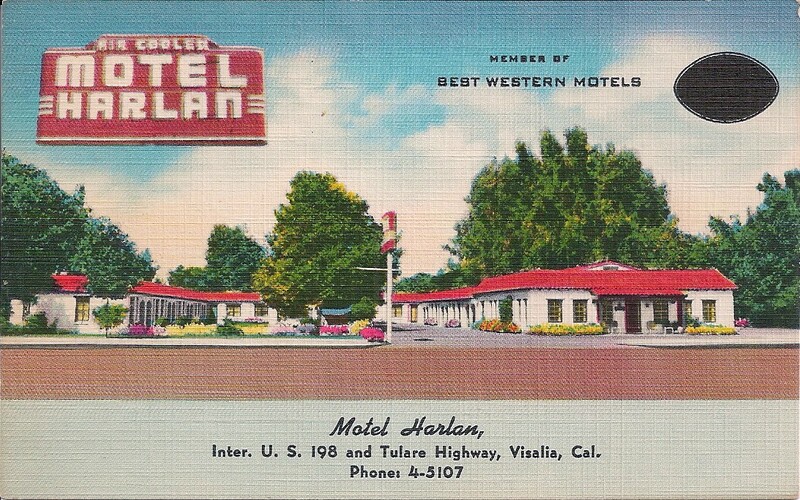 Located at Highway 198 and the Tulare-Visalia Highway (now Mooney Blvd. ), the Spanish style motel made in a U shape even had garages and a coffee shop. The restaurant was operated by Mr. and Mrs. Bill Squires. I don't know when the motel was demolished, but I suspect it was during the construction of the "sunken" Highway 198 nearby. Does anyone remember the motel or know the Harlan's or Squires? ***In the last HH I featured the Bartell-Todd Service Station. In the photo was a majorette, well guess what? Marian Shippey Cote's cousin's wife, Adrienne Taylor Brummer, saw the photograph and identified the majorette as her sister, Earlene Taylor (Leonard) who is now deceased. Thanks Marian and Adrienne for this identification. Visalia Then & Now is an interesting look at the town's history. It is a trip through time, comparing old Visalia photographs with contemporary photographs showing how the town has changed and how it has stayed the same. A wonderful way to understand history with images pictured side by side. Get your signed copy today. For questions or ordering information please email visaliahisterry@gmail.com or click on the above cover photo. 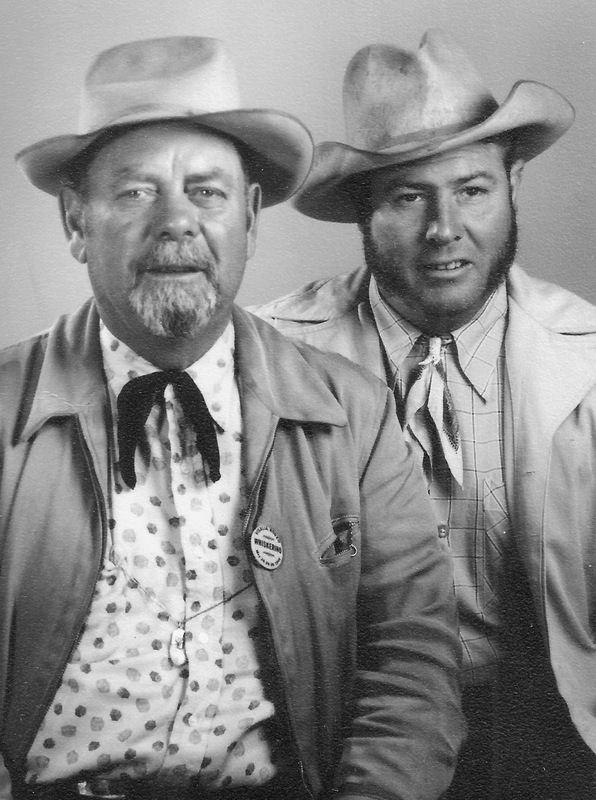 Tulare County was a tough place with plenty of rough and tumble characters! Read about this untamed land in a newly released book called Wild Tulare County Outlaws, Rogues and Rebels. Filled with historic photos and packed with incredible stories, the book clearly makes Tulare County part of the old west. Get your signed copy today. For questions or ordering information please email visaliahisterry@gmail.com or click on the above cover photo. Visalia is believed to be the oldest San Joaquin Valley town between Los Angeles and French Camp.